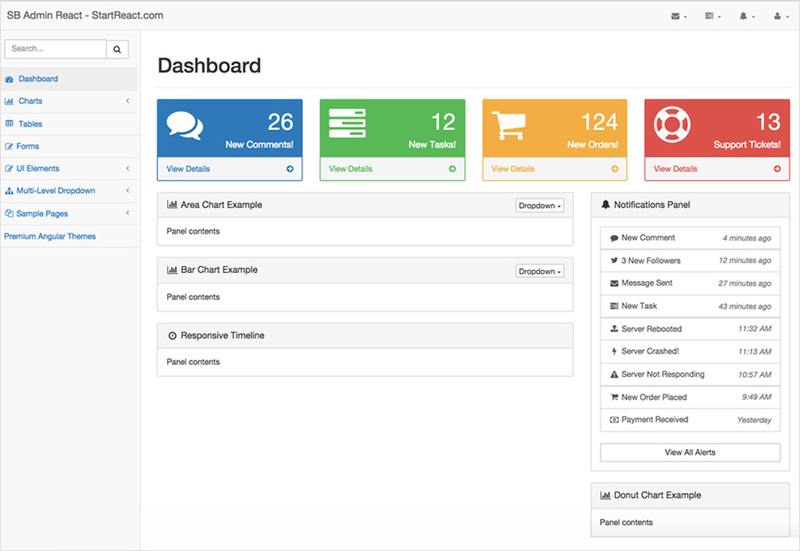 This project is a port of the famous Free Admin Bootstrap Theme SB Admin v2.0 to React.js Theme based on Essential React using ES6 & Webpack. how i create by default login page in these theme ? give me reply fast. You need to change routing defined in routes/index.js for login page and also for other components. Great subject, the truth is that it has helped me a lot, Thank you! If you were so kind, I would be very helpful to know how to replace the index.js to index.html in the dashboardPages components. I see the version of react is used here is 0.13.3 while the current available react version is 15.0.2, all the components used here is totally outdated and deprecated. Yes this is in our roadmap, we will update the theme. Hey, great open source project! I converted sb-admin-2 to React last year.. I didn’t even think to make it public! Thanks for sharing. Thanks for the awesome effort!